講師：Can you hear and see me clearly? And do you know that I can't see you my side? 私：I do have web camera actually but I've just moved back from oversea so quite many stuffs are still missing. I know it's somewhere in my house but I haven't found it yet.sorry! 講師：Oh I see. That is totally okay. I can hear you clearly, so, no problem. 講師：Before we start lesson, do you mind if I drink my tea during our lessen? 私：No, I don't mind. Not at all. If a foreigner asked you to recommend the best coffee place in your town/city, which place would you recommend? 講師：How do you think about popularity of coffee in Japan and Australia? Which country has more popularity of coffee? 私：Well…uhm. New coffee shops open in Japan nowadays so definitely coffee became more popular in Japan than it used to be. 講師：Oh, really? What kind of coffee shops do you have in Japan? 私：There are Starbucks or Gloria jeans. In addition There are a local coffee shops,too. By the way I prefer the local one better. 講師：I know our lessen will be finished soon but if you give me a couple of seconds, I will make quick summary for you, okay? 講師：Okay now, the one final question for you. Which do you like better, Read or Watch? 私：I think it's depends. I love watching movies and reading books such as "Harry potter". Thank you ○○ San for making it DMM Eikaiwa. Thank you also for participating today. you did a great job of understanding and comprehending today's lesson. You are very attentive and eager to learn and you are doing an awesome job at maximizing your abilities in English thanks to the enthusiasm. Great class today, keep enjoying reading novels and practicing your English. Until we meet again, take care! 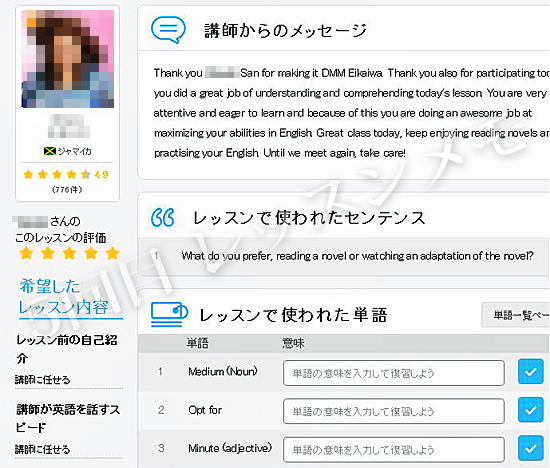 講師：I noticed that you requested to use "conversation" materials today's lessen, is that correct? And also you prefer me to speak normal speed, is that correct?" 講師：Can you guess what's this mean? 私:Bacon? Why bacon? Does it have anything to do with the bacon？ I have no idea. 講師：You'll use this idiom for the situation about arguing with someone who being lazy. For instance, if your husband or your son is just staying home doing nothing but watching TV or playing video game, you could say to them " You! Get out of house now and bring home the bacon!". It means stop being lazy and do something worthy. Get a job and earn some money, if it's in this situation. 私：Oh, I get it now. Wow.it's just interesting. Thank you ○○-san for booking this lesson with me. You did very well with your English reading and pronunciation. Keep it up! However you need to practice sentence construction so that you do not have a difficulty trying to explain your opinion. Have a great day. See you again soon. Hello ○○-san. During your conversation lesson, you showed great understanding and interest in using the food idioms that were provided, well done! Your English speaking is good but try to study more vocabulary so that your sentences flow. Looking forward to another great lesson with you.